On multiple levels, selling a home is never easy. The preparations, the agents, the listing, and the constant stream of window shoppers and negotiations all add up. One of the biggest strains is the difference between what you think your home is worth, and what others are willing to pay for it. One way to help both bridge that gap and have more people interested in your home is enhancing its curb appeal: the first impression people get when they see your home from the street. 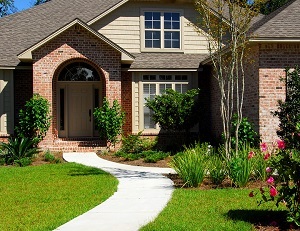 And one of the best ways to raise curb appeal before selling your home is through landscaping. Obviously, the first place to focus on is your front yard. As the biggest representation of first impressions of potential buyers, spending some time and money before you put up that for sale sign can pay big dividends when you put your place on the market. Two major points to focus on should be the lawn and the garden. Make sure your grass is clear of patches and discoloration. Reseeding and fertilization may be needed, and in extreme cases, the lawn may need to be replaced. You should also make sure it’s regularly mowed. The garden should have a good selection of plants and mulch for the season. Walkways and retaining walls in the front area should be cleaned and repaired, but it might also be a good time to replace older hardscape. Overhauling retaining walls in the front yard can dramatically change the framing of your home for the better. If you have walkways that are stained or cracked, now would be a good time to replace them with a fresh look. Make sure to update your backyard hardscape to match, including patios. In addition to major redesigns above, there are other parts of your landscape as well to think about when you’re building curb appeal. Plant Installations: A new garden or new trees can help set your home apart from the others on the block. Lighting: Home lighting can not only help security around the home but also show off your home at night to potential buyers. Irrigation: How easy is it to maintain your grounds? A new irrigation system while landscaping can provide ease-of-maintenance as a buying perk. Driveway: Another eye-catching option is to replace your asphalt or concrete driveway with a brick or paver driveway (see out blog comparing the options here). By investing into landscaping now before you sell, you can pass on those costs to your future buyer as well as lock in your higher price tag: all while also increase the number of interested buyers. Want to know more about your options to increase your curb appeal before you sell? Contact Greener Horizon. We’ll provide a complimentary consultation for your home to make sure you can get the most when you sell.